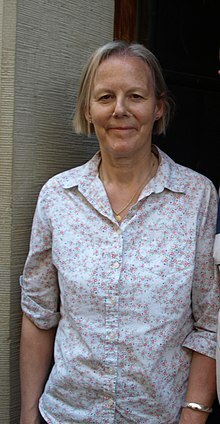 Phyllida Christian Lloyd, CBE (born 17 June 1957) is an English film director, best known for her work in theatre and as the director of Mamma Mia! and The Iron Lady. Lloyd was born and raised in Nempnett Thrubwell, Somerset, south of Bristol. After graduating from Birmingham University in 1979 (BA, English), she spent five years working in BBC Television Drama. In 1985 she was awarded an Arts Council of Great Britain bursary to be Trainee Director at the Wolsey Theatre, Ipswich. The following year she was appointed Associate Director at the Everyman Theatre, Cheltenham, then in 1989 Associate Director of the Bristol Old Vic, where her production of The Comedy of Errors was a success. She moved on to the Royal Exchange Theatre, Manchester where she directed The Winter's Tale, The School for Scandal, Medea, and an acclaimed production of Death and the King's Horseman by Wole Soyinka. In 1991 she made her debut at the Royal Shakespeare Company with a well-received production of a little-known play by Thomas Shadwell, The Virtuoso. Although she followed this in 1992 with a successful production of the rarely seen Artists and Admirers by Alexander Ostrovsky, she has, as of 2007, never returned to the RSC. Also in 1992 came her first commercial success: her Royal Court Theatre production of John Guare's Six Degrees of Separation transferred to the West End. In 1994 she made her debut at Royal National Theatre with a production of Pericles which divided the critics. There was general praise, however, for her productions of Hysteria by Terry Johnson at the Royal Court and Bertolt Brecht/Kurt Weill's The Threepenny Opera at the Donmar Warehouse. By this time, Lloyd's work had come to the attention of Nicholas Paine, then running Opera North. For her debut as an opera director he steered her to what was, at least in the UK, an obscurity – L'Etoile by Chabrier. The production was a great success, setting Lloyd on a significant and award-winning career as an opera director. Productions since then include La Boheme, Gloriana, Cherubini's Medea, Albert Herring and Peter Grimes for Opera North; Dialogues of the Carmelites for English National Opera/Welsh National Opera; Verdi's Macbeth (for the Bastille Opera and the Royal Opera House Covent Garden); the premiere of Poul Ruders' opera The Handmaid's Tale (from the novel by Margaret Atwood); and a controversial Ring cycle for ENO. She received an International Emmy, a FIPA d'Or and the Royal Philharmonic Society Award. In spite of the mixed reception accorded to her first production at the National Theatre, Lloyd nonetheless returned to direct productions of The Way of the World, Pericles, What the Butler Saw, The Prime of Miss Jean Brodie and The Duchess of Malfi, which were well received. She directed an award-winning production of Boston Marriage at London's Donmar Warehouse in 2001. Other recent work includes Friedrich Schiller's Mary Stuart newly adapted by poet Peter Oswald, which ran at the Donmar Warehouse, London, and was transferred to the Apollo Theatre, London, and then to the Broadway in spring 2009. In 1999, Lloyd was offered the chance to direct the ABBA musical Mamma Mia!, which became a hit, not only in the West End and on Broadway, but worldwide. She directed the 2008 cinematic adaptation, which marked her feature debut. By the end of 2008, the film had been certified as the biggest grossing film at the UK box office ever. It was also certified as the UK's biggest-selling DVD. She was nominated as Best Director of a Play in the 2009 Tony Awards for her production of Mary Stuart. Lloyd directed The Iron Lady, a biopic of former British Prime Minister Margaret Thatcher, with Meryl Streep as Thatcher. The film entered production in January 2011 and was released in December of that year. In 2014 she directed Henry IV in the West End. Oxford University named Phyllida Lloyd the Cameron Mackintosh Visiting Professor of Contemporary Theatre in 2006, the same year she was awarded an honorary degree by Bristol University. She was named one of the 101 most influential gay and lesbian people in Britain by The Independent newspaper in 2008; and in 2010 was ranked 22nd (dropping from 7th the previous year) in the same list. Lloyd was appointed Commander of the Order of the British Empire (CBE) in the 2010 New Year Honours. DLitt, Honorary Degree, 2009 Birmingham University. On 16 August 2018, Lloyd condemned the destruction of the Said al-Mishal Cultural Centre in an Israeli airstrike on Gaza five days earlier. ^ a b "Phyllida Lloyd: Prime mover". The Independent. 31 December 2011. Retrieved 14 January 2019. ^ "Phyllida Christian Lloyd | Graduation". University of Bristol. 14 July 2006. Retrieved 14 January 2019. ^ Saner, Emine (25 November 2016). "Phyllida Lloyd: a director who's determined to put women centre stage". Guardian. Retrieved 27 November 2016. ^ Irvine, Chris (30 October 2008). "Mamma Mia becomes highest grossing British film". The Telegraph. Retrieved 1 January 2009. ^ "Mamma Mia! tops all-time DVD list". BBC News. 1 January 2009. Retrieved 1 January 2009. ^ "Phyllida Lloyd named Cameron Mackintosh Visiting Professor". University of Oxford. 19 January 2006. Retrieved 20 April 2008. ^ "Honorary Graduates". University of Bristol. 31 July 2006. Retrieved 20 April 2008. ^ Tuck, Andrew (2 July 2006). "Gay Power: The pink list". The Independent. London: Independent News & Media. Archived from the original on 7 January 2008. Retrieved 20 April 2008. ^ "The IoS Pink List 2010". The Independent on Sunday. London: Independent Print Limited. 1 August 2010. Retrieved 11 September 2011. ^ "University of Birmingham". thecompleteuniversityguide.co.uk.